Born in New Zealand in 1907, Bill Holland first traveled to Japan at the age of 21 to take part in the conference of the Institute of Pacific Relations, beginning over thirty years of association with the organization. 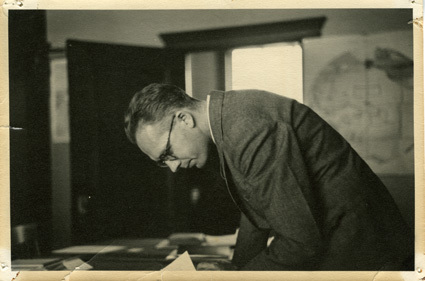 During his time at IPR, Holland held a number of leadership positions, including Research Secretary (1933-1944), Secretary-General (1946-1960), and editor of its periodicals Far Eastern Survey and Pacific Affairs. He took leave from the IPR twice: to study for a MA in economics under John Maynard Keynes at Cambridge (1934) and, during the Second World War, to become acting director of the Office of War Information in Chungking, China. Founded on an internationalist philosophy as a forum to discuss relations between Pacific nations, the IPR was targeted under the McCarthy-era McCarran act during the 1950s, accused of Communist sympathies. After political pressure led the IPR to disband in 1960, Holland accepted a position on faculty with the newly created Department of Asian Studies at the University of British Columbia (1961-1972), helping to lead that department to international prominence. He remained in BC until the death of his wife Doreen in 1990, after which he settled in Amherst to live with his only child, Patricia G. Holland. Holland died in Amherst in May 2008. The Holland Papers are a dense assemblage of correspondence of Bill Holland, his wife Doreen, and their family, from his first trip abroad in the 1920s through the time of his death. Although largely personal in nature, the letters offer important insight into Holland’s travel in pre-war Asia, his work with the IPR, the war, and the of the 1950s. The collection also includes a wealth of photographs, including two albums documenting trips to Japan, China, and elsewhere 1929-1933.